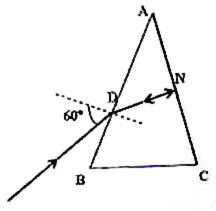 d = i1 + i2 – A where i1 and i2 are respectively the angle of incidence and the angle of emergence and A is the angle of the prism. Here we have i1 = 60º, i2 = 0º (since the ray falling normally will proceed undeviated from the face AC if it is not silvered) and A = 60º. (2) In the above question, what is the refractive index of the material of the prism? (3) Two thin (small angled) prisms are combined to produce dispersion without deviation. One prism has angle 5º and refractive index 1.56. If the other prism has refractive index 1.7, what is its angle? On this site you will find many questions (with solution) on refraction at plane surfaces as well as at curved surfaces. To access all of them type in ‘refraction’ in the search box at the top left side of this page and click on the adjacent ‘search blog’ box. Offline submission of Application Form may be made using the prescribed application form. The Information Bulletin and Application Form costing Rs.600/- (including Rs.100/- as counselling fee) for General & OBC Category Candidates and Rs.350/- (including Rs.100/- as counselling fee) for SC/ST Category Candidates inclusive of counseling fee can be obtained against cash payment from 22-10-2008 to 01-12-2008 from any of the branches of Canara Bank/ Regional Offices of the CBSE. 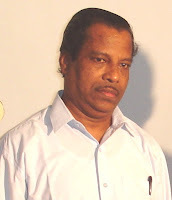 Find details at http://www.aipmt.nic.in/. 2. Through Demand Draft in favour of the Secretary, Central Board of Secondary Education, Delhi drawn on any Nationalized Bank payable at Delhi. Instructions for Online submission of Application Form is available on the website http://www.aipmt.nic.in/. Application Form along with original Demand Draft should reach the Board on or before 04-12-2008 which is the last date stipulated. Visit the web site http://www.aipmt.nic.in/. for all details and information updates. In both cases the net driving force is 3mg – 2mg = mg. But in case (i) the total mass moved is 5m where as in case (ii) the total mass moved is 2m. The acceleration in case (i) is mg/5m = g/5 where as the acceleration in case (ii) is mg/2m = g/2. The ratio of accelerations = (g/5)/ (g/2) = 2/5 [Option (e)]. The body is retarded (as indicated by the negative sign) because of forces opposing the motion. 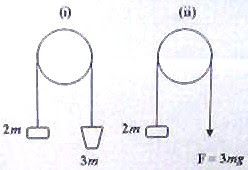 The opposing force has magnitude ma = 4×0.5 = 2 N. Therefore, a force of 2 N has to be applied opposite to the opposing forces to keep the body moving with the velocity of 2 ms–1.